Hi everyone. 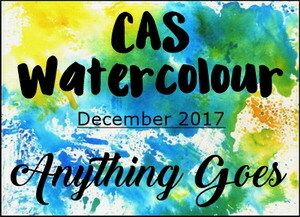 I created another card for the CAS Watercolour December Challenge - Anything Goes. Having more fun playing with DOX inks. I do love how the inks layer to create beautiful backgrounds. This combination of red and purple makes me happy. :) I created a regular A2 size smooshed background and was able to use it for both the flowers and the piece behind the honeycomb aperture. I stamped a sentiment banner in the same purple ink and adhered it to the bottom of my card front. Quick and easy card! There's still a few days left for the CAS Watercolour challenge, so come play along. Challenge closes Dec. 24th at midnight (PST). Fabulous as always Loll.... love that die! Beautiful! I need to remember this color combo! Love that wonderful colour combination! How perfect to have the piece to fit behind the honeycomb and to die cut the flowers! Love these colors, Loll! Beautiful flowers and matching piece behind the honeycomb that looks like flowers in front of the trellis and behind! So pretty, and love the colors. Quick and easy in YOUR hands maybe. I would have struggled to think of a way to use the smooshed colors! I like that cutout honeycomb corner that allows the underneath to shine out and complement those lovely flowers! TFS, Hugs & Merry Christmas too! Loll, gorgeous colours and love the honeycomb die cut background. What a gorgeous combination of colors and beautiful design! Love how you matched the die cut flowers to the background color behind the mixed media die! This is so well done! Quick and easy maybe, but also is absolutely stunning Loll. What a lovely card! The colors are stunning!! I so wish I could do better at creating CAS cards. I never know when to stop. Your card is beautiful inspiration! Merry Christmas to you Loll! What a beautiful card, Loll! So vibrant and pretty. You do such a wonderful job creating lovely and striking CAS cards. Thank you so much for sharing. And thank you for the beautiful holiday card you sent me. I so appreciate your thoughtfulness! And I love the trees! My daughters do, too. :) Hugs!! Just lovely. I hope your holidays are wonderful shared with your family, Loll. Thanks for sharing your beautiful cards and techniques all through the year. I wish you another terrific new year with health and happiness. Such a gorgeous blend of colors, Loll, and the design is beautiful! Have a wonderful Christmas! Just wonderful what you create with different types of ink! I finally have some DOX but haven't had time to play yet... This is a gorgeous card!